A 16.55 kg stone, mostly covered with dark gray fusion crust, was found in 1979 in a corn field after a farmer hit it with a plow. Two decades after its recovery, D'Orbigny was classified as an angrite. In fact, D'Orbigny is by far the most massive Angrite. Angrites are characterized by their low alkali contents, high Ca/Al ratios, and a somewhat variable but still distinctive mineral assemblage (e.g., various Ca, Al, &/or Ti-rich phases). Angrites are also very ancient rocks. Recent crystallization ages ≥4.562 billion years have been reported for D'Orbigny (Amelin, 2007; Spivak-Birndorf et al., 2009) making it one of the oldest known differentiated rocks in the solar system. http://www.lpi.usra.edu/meteor/metbull.php?code=7714 also mentions a silicophosphate (probably a "silicoapatite"). 20 valid minerals. 3 (TL) - type locality of valid minerals. Reference: http://www.hou.usra.edu/meetings/lpsc2014/pdf/1818.pdf; Keil, K. (2012) Angrites, a small but diverse suite of ancient, silica-undersaturated volcanic-plutonic mafic meteorites, and the history of their parent asteroid: Chemie der Erde, geochemistry 71:191-218. Reference: http://www.lpi.usra.edu/meteor/metbull.php?code=7714; Keil, K. (2012) Angrites, a small but diverse suite of ancient, silica-undersaturated volcanic-plutonic mafic meteorites, and the history of their parent asteroid: Chemie der Erde, geochemistry 71:191-218. Reference: Keil, K. (2012) Angrites, a small but diverse suite of ancient, silica-undersaturated volcanic-plutonic mafic meteorites, and the history of their parent asteroid: Chemie der Erde, geochemistry 71:191-218. Reference: Hwang, S. L., Shen, P., Chu, H. T., Yui, T. F., Varela, M. E., & Iizuka, Y. (2016, March). Tsangpoite: The Unknown Calcium Silico Phosphate Phase in the Angrite D'Orbigny. In Lunar and Planetary Science Conference (Vol. 47, p. 1466). Reference: Kurat, G., Varela, M. E., Brandstätter, F., Weckwerth, G., Clayton, R. N., Weber, H. W., Schultz, L., Wäsch, E. & Nazarov, M. A. (2004) D'Orbigny: A non-igneous angritic achondrite? Geochimica et Cosmochimica Acta 68 (8): 1901-1921. (April 2004); Keil, K. (2012) Angrites, a small but diverse suite of ancient, silica-undersaturated volcanic-plutonic mafic meteorites, and the history of their parent asteroid: Chemie der Erde, geochemistry 71:191-218.; Hwang, S. L., Shen, P., Chu, H. T., Yui, T. F., Varela, M. E., & Iizuka, Y. (2016, March). Tsangpoite: The Unknown Calcium Silico Phosphate Phase in the Angrite D'Orbigny. In Lunar and Planetary Science Conference (Vol. 47, p. 1466). 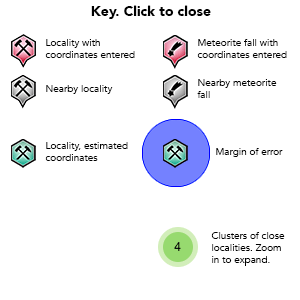 Reference: http://www.lpi.usra.edu/meteor/metbull.php?code=7714; Keil, K. (2012) Angrites, a small but diverse suite of ancient, silica-undersaturated volcanic-plutonic mafic meteorites, and the history of their parent asteroid: Chemie der Erde, geochemistry 71:191-218.; Hwang, S. L., Shen, P., Chu, H. T., Yui, T. F., Varela, M. E., & Iizuka, Y. (2016, March). Tsangpoite: The Unknown Calcium Silico Phosphate Phase in the Angrite D'Orbigny. In Lunar and Planetary Science Conference (Vol. 47, p. 1466). Reference: Hwang, S.-L., Shen, P., Chu, H.-T., Yui, T.-F., Varela, M.E. and Iizuka, Y. (2016) Matyhite, IMA 2015-121. CNMNC Newsletter No. 31, June 2016, page 692; Mineralogical Magazine: 80: 691–697. Reference: Kurat, G., Varela, M. E., Brandstätter, F., Weckwerth, G., Clayton, R. N., Weber, H. W., Schultz, L., Wäsch, E. & Nazarov, M. A. 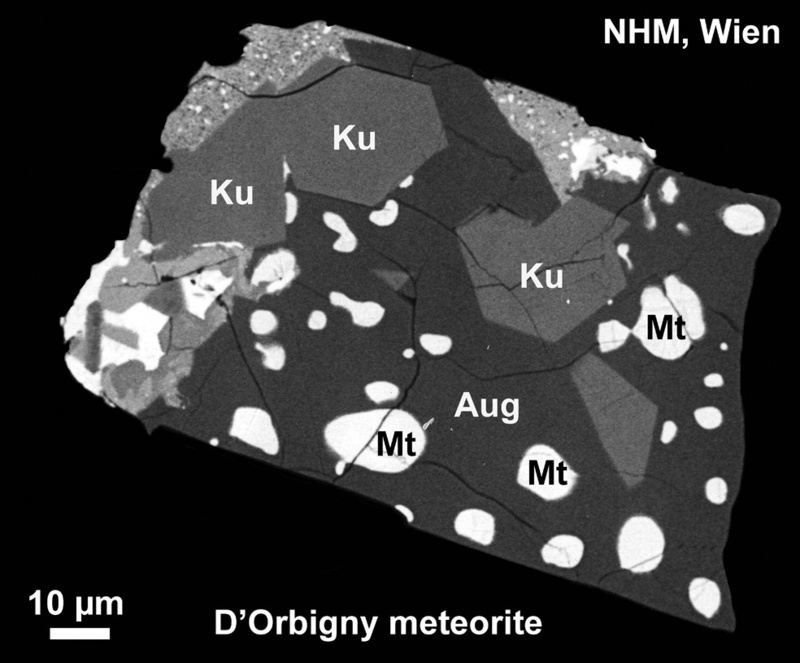 (2004) D'Orbigny: A non-igneous angritic achondrite? Geochimica et Cosmochimica Acta 68 (8): 1901-1921. (April 2004); Keil, K. (2012) Angrites, a small but diverse suite of ancient, silica-undersaturated volcanic-plutonic mafic meteorites, and the history of their parent asteroid: Chemie der Erde, geochemistry 71:191-218. Reference: Hwang, S.-L., Shen, P., Chu, H.-T., Yui, T.-F., Varela, M.E. and Iizuka, Y. (2015) Tsangpoite, IMA 2014-110. CNMNC Newsletter No. 25, June 2015, page 533; Mineralogical Magazine, 79, 529-535. Kurat et al. (2004): Geochimica et Cosmochimica Acta 68, 1901–1921.